We started to enjoy the vegetables in our CSA share. Sunday morning, Howard made scrambled eggs with sauteed leeks and peppers, a tasty way to start the day. For dinner, I decided to use the kohlrabi. I’d never seen or eaten kohlrabi before. In case you haven’t either, unfortunately, I forgot to take a picture. I did find a picture on the web though. Rather ugly, I think. 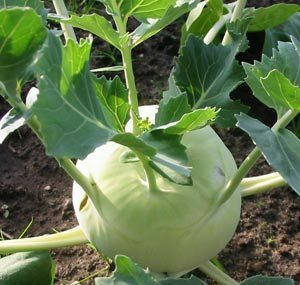 Kohlrabi is in the cabbage family. To me, it tastes similar to turnip or rutabaga, which makes sense given that, according to Wikipedia, kohlrabi is also known as German turnip. I made a chicken and kohlrabi stew served over barley. Not only did I use the kohlrabi, but I also included onions, carrots, cabbage, and parsley from the CSA share. I loved the yellow color from the tumeric and saffron. It was a perfect autumn dinner. I’ll change a few things when I make it again. I’d take the chicken off the bone. Howard thought it was hard to take the meat off the bone with a spoon. The stew also would have done well in the slow cooker. Now that my kohlrabi is gone, I could use turnip or rutabaga in its place. In a large soup pot, heat the oil and saute the onions, salt, and spices for 5 minutes. Add the chicken, and cook to lightly brown, about 5 minutes. Add the tomatoes, water, and parsley. Bring to a boil. Reduce the heat, cover, and simmer for 20 minutes. Add the kohlrabi, cover, and simmer for 15 minutes. Add the carrots, cover, and simmer for 10 minutes. Add the cabbage and simmer, uncovered, 10 minutes longer, or until all the vegetables are completely tender. Serve in shallow bowls over cooked barley.